I take bathroom breaks during song and dance numbers… or refill my drink… or check my email. It might as well say “interlude” on the screen because that’s what these musical performances are—breaks in the narrative. I cannot stomach this sort of discontinuity unless, of course, it proves itself worthy of disrupting the investment I put into the plot. Worthiness is measured by the quality of the tune, or the actors’ absolute beauty, or the acrobatic moves of the dancers, which have to be something exceptional because no one pays money to see an average dancer. I know, I have pretty high standards. This is not to say I hate all musical numbers in films because I have seen many that were genius. The other day I watched a video of a hit Hindi song from the Bollywood film Dostana (2008). The number contains fun dance moves, three gorgeous stars, bright lights and what looks like a hundred back up dancers. It is spectacle to the max, and yet I could almost see myself walking away from the screen. The only trace of narrative in this musical piece is when the two men dance together to uphold the lie they created about their sexuality; the dance is not even funny. There are also instances where the men compete for the female lead, which also teeters on being more cheesy than funny. However, a third man sings the last chorus, a third suitor who the female lead does not think is a gay and therefore he is a prime candidate for her affection. Also, he is her boss and as a result automatically at a better standing than the other men. Here, we are brought back into the narrative within this number. The two “homosexual” candidates panic while the actress and her boss flirt and exchange laughs. All the while, the backup dancers are still going on, the music is still heard. This is a complete Gene Kelly moment in which the narrative and spectacle are integrated naturally and seamlessly (Pattullo: 73). The characters’ facial expressions reveal their dismay while the continuing of the number in the background illustrates just how easily their mutual love interest has moved on to the next one or has never even noticed them. The song and dance has now taken on a greater meaning within the film text (79). Since this song adds significance to the film, how dare I check my facebook during it? This entry was posted in READING and tagged Lauren Pattullo, Narrative and Spectacle in the Hollywood Musical Interlude: Contrasting the Choreography of Busby Berkeley and Gene Kelly on September 29, 2010 by Rajwinder Kaur. The film industry and its audiences had a complex, one can even go out on a limp and say abusive, relationship since cinema’s inception. Here the term “relationship” is specifically used to highlight that the engagement of these entities is a two way street. One is not exclusively dominant the other, nor are any of these players passive. Stepping outside the realm of fandom, it should be made clear that audiences engaged in ways that diverged from the industry’s expected practices. Particularly, the church used films for their interests or made them suitable for their members. To boost their attendance, churches used films as an attraction, but soon this became a short-lived conservative middleclass alternative to the cinema itself (Fuller: 86). Occasionally, a motion picture was used with and even as the sermon (89). Indeed, it was difficult to find films that were suitable for this particular audience. Covering the projection during unsuitable scenes or cutting out the film were not effective workarounds (91). It is not the decline of this practices that is significant here, instead we must acknowledge the initiative of the church. Secondly, even with fandom, we can find a variety of interesting practices. Not only were hoards of fanmade scripts sent to studios, but aspiring actors and actresses waited outside studios for their chance. And sometimes they got it. Surely, these practices still exist today, however it is interesting to discover that this has been going on since the 1920’s. In addition, although it does seem as though audiences are passive here, the reality is fans brought about the star system. It was in fact the industry that had to respond to fans’ increasing demands for actor paraphernalia. Fans demanded to know the identities of these stars, taking the lead in making them into household names. This entry was posted in READING and tagged At the Picture Show, Chapters 4-6, Kathryn H. Fuller on September 26, 2010 by Rajwinder Kaur. Sometimes we cannot help but develop a relationship with a film star. We’ve seen them on the big screen dozens of times and depending on the star, they take on a different role in each flick. Thus, it can so happen that with each role, another facet of this star’s persona becomes revealed to us. In time we have constructed a whole personality for our star of choice. They can be adventurous, humorous, courageous, and emotional all at one—like any other person. The ideal breaks when we are reminded that this is a persona that is constructed. Nevertheless, we have extratexual material to prove that our mind’s creation has some legitimacy to it. Magazines, interviews and other appearances reinforce the construction. So then, we must ask where does the actor as a person end and the character begin? How interrelated are these two entities? Are the extratexual sources reinforcing the character or is the actor revealed through the film roles? This exact paradox is underlying in Amelie Hastie’s Louise Brooks, Star Witness. 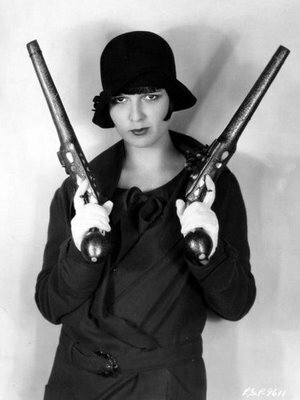 Louise Brooks has convoluted her identity, particularly her sexual identity and life, with a combination of the statements she has made, her film roles and her memories. Initially, she stated that she could not write about her life truthfully because life is predicated on one’s romantic experiences and she was not willing to disclose the latter (Hastie: 3). Secondly, she starred as a sexually ambiguous (possibly lesbian) character in Pandora’s Box, the role she is most famous for. As a result, viewers contemplate one of two things about the star: either she is a lesbian who is not willing to write upon it because it would define her indefinitely or she is not and the mystery associated with her persona would vanish. Finally, she reveals that she is neither opposed to the idea of being a lesbian and in fact may have had relations with women, but she loves men (10). As a result, we are still left where we have started. Because nothing was wholly denied, is she or isn’t she? Is her sexuality aligned with her character Lulu, or has she taken on this persona so that her role could be reinforced? She leaves this for her fans to decide, as do other stars, because ruling one thing out would breaking the enigma. And this enigma is often precisely what attracts fans to a particular star. This entry was posted in READING and tagged Amelie Hastie, Lousie Brooks, Star Witness on September 22, 2010 by Rajwinder Kaur. “You know where this song is from?” says my friend as we lay out on the grass on the last of Middlebury’s spring days. I knew I heard the song; it was definitely from an epic movie. I could see a tall, brunette hero preparing for battle, and before he leaves he plants one last kiss on his sleeping beloved. But no, I could not name the flick. “It’s Lord of the Rings,” my friend finally reveals. I guess I was close? The issue here is not necessarily my lack of knowledge of movie scores, but the general opinion that sound accompanies the image. The former enhances the latter either by making the film more cinematic or realistic. Sound and music have become so fused with movies that it is impossible to separate the two, let alone identify a score without the images it was first associated with. It also does not help that moviegoers usually leave their seats right when the credits appear on screen, not bothering to wait for the soundtrack information. This sentiment is rooted in the myth Rick Altman debunks: “There never was a silent film” (Altman: 648). Altman details this by first illuminating that a piano in the theater did not inevitably indicate that a pianist or singer were on shift or that the theater could even afford the musical accompaniment at the time (662). In addition, if there was music, it may have only surfaced between the films as a musical interlude (664). Moreover, often the music heard in the exhibition site filtered in from the “bally hoo” going on outside (664). This means that the music may not have been to quell the sound of the projector inside but to attract more customers outside. The uncertainty surrounding early use of music and sound with film may arise from the notion that music has been seen as an accompaniment. If the song is not popular as a separate entity, it is difficult to extract the sound from the image. This might be an overstatement about music’s role in film but it does not change the fact that scholars need to dig deeper into sound’s role, and Altman can attest to at least this much. This entry was posted in READING and tagged Rick Altman, The Silence of the Silents on September 19, 2010 by Rajwinder Kaur. I could never really get into theater. I find seeing characters at a distance disengaging and would often struggle keeping myself awake through the performance. I understand that actors feed off the crowd’s energy and there is something truly magnetic about having that direct, instant connection with one’s audience, but I would not consider myself one to reciprocate this bond. Instead, it was film and television that reached me at my seat, in my home or at the cinema. Although the actors cannot feed off the crowd’s energy directly in a film, the audience is granted the luxury of a woman’s crying face, a transfer of a suspicious weapon into the pocket of an innocent man, or the holding of two forbidden lovers hands. These images have the ability to flood the screen so that our attention is focused on these acts for a similar effect of engagement. It was this lack of close-ups that limited my appreciation for theater. So imagine my surprise when reading about the Laterna Magika Theater—a true, synchronized fusion of theatre and film (Burian: 33). Many critics have categorized film as an extension of theatre, as a method of mass reproduction of what already existed on stage. Upon studying film as an entity onto itself and not a limb of the theatrical arts, it is fascinating to finally visualize through Jarka Burian’s text how these two can complement each other. The camera is not a canned reproduction of the stage and the stage is not a live action version of a film. Imagine seeing a ball tossed on a colossal screen and then caught by a woman standing on the stage. The two have become one. Theater has acquired close-ups and film has acquired direct connection with its audience. This entry was posted in READING and tagged Jarka M. Burian, Laterna Magika as a Synthesis of Theatre and Film: Its Evolution and Problematics on September 14, 2010 by Rajwinder Kaur. Peter Kramer, in his piece A Slapstick Comedian at the Crossroads, traces comedy star Buster Keaton’s beginnings in vaudeville to his breakthrough into cinema. 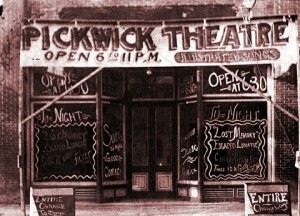 Aside from providing the reader this information, Kramer touches on the perceptions critics, audiences and performers had of the theater, vaudeville and cinema. 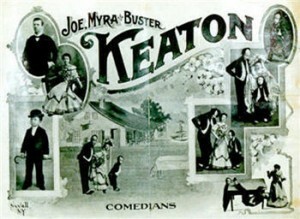 Keaton was born into the entertainment industry and had already acquired fame as a child vaudeville star. His father, a falling star himself, had despised the cinema. His reasoning was that the cinema took away from the audience’s enjoyment, which was rooted in the perfection of the performance. If the Keaton routine were placed on filmstrip, the mass production would take away from their unique performance and connection with the audience (Kramer: 137). Evidently for artists, vaudeville required more skill than legitimate up market entertainment, or the theatrical musical comedy. Legitimate artists worked with scripts, stage managers, and other staff in order to complete their production, while the vaudeville star played all these parts and more himself (136). Although Keaton was encouraged to “go legitimate,” he held off due to his father. His contemporary had stated that he found a legitimate audience to be easier to please, and more willing to wait for the laughs while vaudeville viewers sought immediate gratification. So now we must question why the terminology “legitimate” is used to describe theater, while vaudeville, although revered, was not considered its equal. This could be in part to the fact that the musical comedy was larger, more stabilized and catered to a wealthier audience. Despite this, there was a sort of “body poetry” associated with vaudeville (141). Cinema, because of the mass reproduction inherent in its nature furthered it from comedy’s free rhythmic nature found present in vaudeville. This entry was posted in READING and tagged Peter Kramer: A Slapstick Comedian at the Crossroads: Buster Keaton, the Theater and the Movies in 1916/17 on September 14, 2010 by Rajwinder Kaur. I hate when people talk during movies. But this is a nuisance that has been going on since cinema’s infancy. Theater managers, studios, producers have no way of controlling this, let alone me. During the Nickelodeon era (1905-1915), audiences conversed not only with each other, but also with the screen. Historians have accounts of moviegoers eating lunch, suckling babies, and viewers translating out loud subtitles for those who could not read, children cheering, and hawkers along the aisles (Fuller: 75). Although there is nothing deviant about these activities, the theater is not the ideal place for them. Essentially this description illustrates a social event similar to a concert or festival. Indeed watching a film is not a passive activity. However, a degree of cordiality is necessary so that the film is internalized. Studios and producers capitalized on this audience energy. Moviegoers attacked studios by sending scripts and photoplay scenarios in hoards. Studios retaliated with screenwriting contests in which the winner’s work was used in a movie. The idea was to establish social control. Because the cinema was still a new phenomenon, a way of movie going needed to be instituted. Similarly, when the television set was introduced, people were unsure where to place this bulky apparatus in their homes. With the coming of nickelodeons, a set movie going etiquette did not exist. The relationship between theaters and moviegoers shifted with the coming of feature length narrative films that required more concentration. In addition, elegant theaters were erected to attract the higher classes (Fuller: 83). The industry, essentially dictated how films were viewed, but breaking the rules has and will always be fun. This entry was posted in READING on September 12, 2010 by Rajwinder Kaur. It is 1905. You leave work and grab a newspaper on the way home. You skim through the headlines: an earthquake in Iowa, cigarettes barred in Wisconsin, Virginia University gets a gift from Rockefeller. And then on the left hand side of the page, reads an ad “Cook & Harris High Class Moving Picture Company. Thursday Evening, April 20th.” The ad illustrates this upcoming night; a ship appears on the big screen, the opera house is full of viewers. So you go home, mark the date on the calendar; surely nothing like this has come to small-town New York yet. Big cities have seen them and now, the moving pictures are finally coming to us. Now jump to 2010, there are cinemas everywhere, we can go whenever we want, see billboards in the most unlikely places of upcoming movies, easily look up showtimes on the Internet and pay only a small fee of $10.50. The convenience has caused us to take for granted how readily we have access to the cinema. During cinemas infancy, the pictures came to you. Traveling companies such as Cook and Harris went to small towns with a two-hour “performance” that featured twenty to twenty five brief film scenes. During intervals, Bert Cook would sing songs while his wife Fannie played the piano (Fuller: 10-12). The local fire department, high school seniors or even the Pentecostal church, making this traveling theatre a part of the community, endorsed these shows. These sponsors than took up to half the proceeds for their causes (14). Traveling shows were virtually put out of business for nickelodeons, a stable, ever present cinema, were established. Any vacant room could be turned into a five-cent, ever present theater (24). And this is how the cinema we see today was transformed. One myth film students will always hear, or should always hear, is that of the alarm early audiences shared when first seeing the Lumiere brothers’ Arrival of a Train at a Station. The reactions range from viewers leaning back, screaming, and even getting up and leaving the exhibition site. This after all, is a myth. Indeed there was a reaction, but this tale assumes that early audiences believed in the moving image the same way a child believes in the Tooth Fairy or Santa Claus. Their reactions would be more similar to what one feels when first watching HD television. The attention shifts to the clearer physical movements, the hairs on an actor’s arms, and even the imperfect skin that has now become strikingly visible. The reaction, therefore, is more towards the innovative technology. First, the camera was able to bring images to life, now it has been fine-tuned to make these moving images capture smaller aspects of reality. Here is where one can find this notion of intellectual disavowal—“I know, but yet I see.” Knowing that a moving image is not reality, but yet it takes on so many of reality’s characteristics (Gunning 117). So how far have we really moved from the early cinema, a cinema of attractions? These initial years were rooted in vaudeville, in illusions, in tricks that sought to entice the audience. Indeed, for Melies the narrative took a back seat for the spectacles years ago, but we still can find examples of when the narrative literally pauses for an explosion or a car flipping over in slow motion just so the filmmakers can give the audience a moment of awe. We still maintain this cinema of instants (123). Once the method of attraction, of advertising early films was the simple command “See!” This direct order sought to tap into an attraction’s primal powers (234). Today, audiences are still allured with the promise of “the thrill ride of the century.” With the coming of motion pictures, the headliners were Cinematographe, the Biograph or Vitascope—the machinery presenting these images—today 3d and IMAX attract audiences. This entry was posted in READING and tagged READING on September 7, 2010 by Rajwinder Kaur.